Telegram Purple is a Pidgin (and other Libpurple-based messengers) plugin which adds support for Telegram. works with libpurple proxy settings. 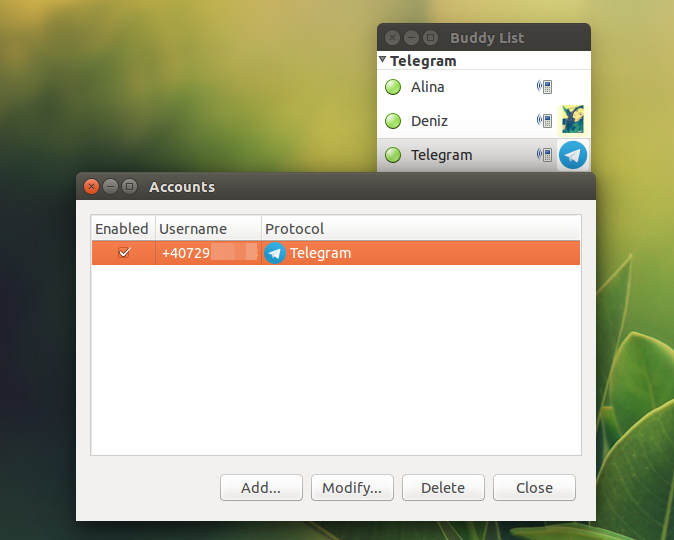 If you're looking for a more featureful Telegram client for Linux desktops, see: Sigram and Telegram Unity WebApp. To initiate a secret chat, you can right click a buddy and select "Start Secret Chat. Also, in the plugin preferences (under Accounts), you can choose the default behavior for secret chats: to ask, auto accept or never accept secret chats. There's an issue with secret chats though: if you accept a secret chat in Pidgin, you won't able to use that chat on your phone. For now, the application doesn't support self destructive messages and they are currently ignored because the developer doesn't "know any way to delete them from the conversation and the history". More info HERE. Even though it lacks some important features for now, Telegram Purple has some advantages over stand-alone solutions, like the ones mentioned above: since you can use it with Pidgin, you don't have to open multiple chat clients and you have all your contacts in a single list. And since it's under heavy development, we'll hopefully see some of these missing features implemented soon. Tip: to use the Telegram iOS or Android Emojis, download them from HERE, copy the Emoji folder to ~/.purple/smileys/ and select the new smiley theme from the Pidgin preference (Themes > Smiley Theme). If you don't want to add the PPA, you can download the Telegram Purple deb from HERE. 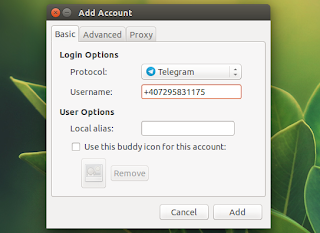 Arch Linux users can install the latest Telegram Purple from Git via AUR. For other Linux distributions, check out the installation instructions available on Telegram Purple's GitHub page. To report bugs or contribute to Telegram Purple, see its GitHub page. Using Telegram Purple with Pidgin is pretty easy. After installing the plugin (see above), start Pidgin (restart it if it was already running) and from its menu select Accounts > Manager Accounts. Here, click "Add" and from the protocol drop-down list, select Telegram. Enter the code and you're done setting up Telegram with Pidgin.